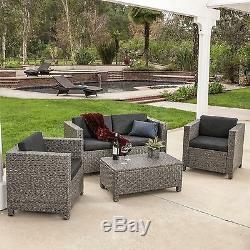 Outdoor Patio Furniture PE Wicker 4pcs Luxury Sofa Seating Set. Venice Outdoor Grey & Black Sofa Set. Modern and functional, you'll enjoy ample seating options for guests and family with the Venice Outdoor Sofa Set. Bring your wine or iced tea and enjoy those luxurious evening hours the spring and summer months offer. The back and seat cushions are soft and comfortable and covered with weather-proof fabric. It's a must-have for those who love the more relaxing side of being outdoors. Set includes 2 club chairs, 1 sofa, and 1 table. 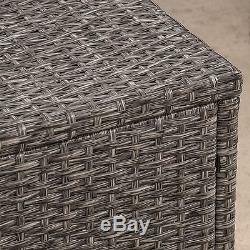 Hand crafted from tightly woven commercial grade grey PE Wicker. UV-, tear-, and weather-resistant in addition to being supple and soft to the touch. Resistant to salt and chlorinated water and colorfast to prevent fading. Wrapped over sturdy, medium weight, rust resistant steel frames. 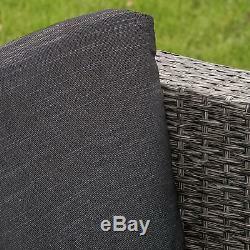 All black cushions covers are zippered, machine washable, and resistant to mold and mildew. High density, quick drying foam cushions ensure comfort and convenience. Designed for extreme temperatures in both hot and cold climates. Virtually maintenance free - simply rinse it clean with a hose. Environmentally friendly and 100% recyclable. Easy to assemble (tools and instructions included). Sofa: 25.5"D x 54.75"W x 26.75H. Table: 19.7"D x 35.4"W x 15.75H. Chair: 25.5"D x 29.5"W x 26.75H. The item "Outdoor Patio Furniture Grey PE Wicker 4pcs Luxury Sofa Seating Set" is in sale since Tuesday, December 29, 2015. This item is in the category "Home & Garden\Yard, Garden & Outdoor Living\Patio & Garden Furniture\Patio & Garden Furniture Sets".